The region, where dialects are still spoken and which occupies one fifth of the territory of Hungary, is characterized by farms, agriculture, half-nomadic animal breeding and lively town life as well as small villages preserving traditions and thermal baths. 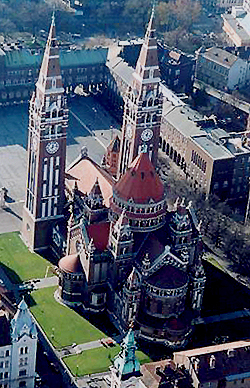 The centre of the region is Szeged, famous for the Open-air Theatre awating visitors with a whole range of prose and music performances every summer. Dóm square and the cathedral arising behind provides a magnificent background for the open stage. The region is not divided by large hills, this is shown by the fact that even orchards arising from the scenery are called hills (högy) by the people living here. There are plenty of fruit trees in the region, which were planted when the sand began to drift and it became necessary to fix the surface of the land. The region is divided by not only mulberry or poplar trees and vineyards. The puszta, which is often mentioned in the poems by Petőfi and which stretches as far as Bokros and Csongrád, has a varied scenery: you can find forests in the flood area, rivers and brooks apart from the farms and towns here, and far away you can see the so-called Cuman hills (kunhalom), which probably served as burial places several thousand years ago. Apart from the wind and the rivers, man also changed the landscape of the region by cutting down and planting forests, regulating rivers and cultivating the sand and loess land of the puszta. These activities provided means of living for the inhabitants, the dams serve as panorama roads, the dead channels rich in fish are excellent for fishing, recreation and relaxation. Beaches also await visitors: the region is so rich in thermal water that you can surely find one bath within a half an hour's ride. On your way you will see farms where the land is still cultivated and animals are kept. Interestingly enough, this region is the richest in farms, although two thirds of the population live in the successors of the former market-towns such as Orosháza, where the majority of the population is Hungarian, the Swabian Bácsalmás, Mezőberény with a mixed population, the Slovakian Tótkomlós or in Szarvas and in Kiskőrös. These different nationalities settled down here after the Turks had been expelled and the villages became uninhabited. Their culture is still preserved, the flower-patterned Serbian embroidery matches the decorative embroidery of Kalocsa in its beauty, the works made in the blue-dying workshop of Bácsalmás are also famous. The folk traditions and the old crafts are being preserved by the wood-carvers, honey-cake makers or by the craftsmen of Tápé or Makó, who deal with wicker-work, rushwork pleating and plaiting of straw using the materials that can be found in the region.